Sometimes, in NYC, it seems like apartment drama controls your life — if you're not looking for a new pad, you're obsessing over lease renewals and rent raises. It's not abnormal to ask a perfect stranger for the name of their broker or the amount of their rent. We're constantly seeking out the latest news when it comes to real estate, and this new infographic has us scratching our heads. Turns out, the fancy-schmancy Upper East Side isn't all that fancy — in fact, according to Zumper, a new search site for apartment rentals, it's got some of the cheapest rent in the city. 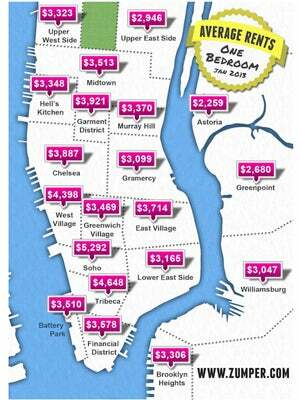 The average rent for a one bedroom in the 'hood will run you $2,946, which is lower than abodes in the East Village, the Lower East Side, Williamsburg, and, well, pretty much every sought-after neighborhood. Don't believe us? Check out the infographic, and maybe start channeling your inner Gossip Girl.